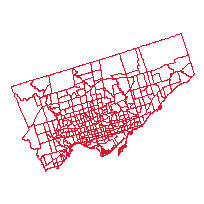 This dataset contains the boundaries of all 301 Census Tracts (CT) in Toronto, Ontario, Canada for the 1961 Census. The shapefiles were created by the University of Toronto's Map and Data Library, using data from the original printed 1961 maps. The shapefiles (.shp) were created by the University of British Columbia, using boundaries from georeferenced versions of the printed 1961 maps.